Did you know that BOMA/Chicago is the only local BOMA in the country that negotiates directly with unions on behalf of member buildings and represents these buildings in grievance hearings? The dedicated and experienced members of the Labor Committee serve as the collective bargaining agent for BOMA/Chicago members, securing labor agreements crucial to the effective management of Chicago office buildings. 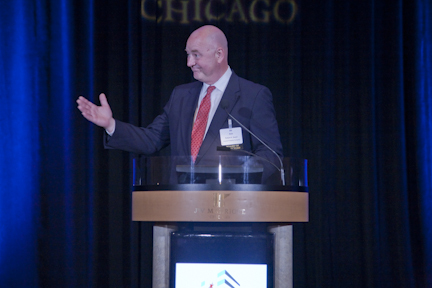 At the 111th BOMA/Chicago Annual Meeting in 2013, I spoke about how our collective bargaining efforts are a core member benefit. In fact, BOMA/Chicago was established on the foundation of labor relations. In 1902, local janitors, elevator operators and window washers organized the Chicago Flat Janitor’s Union, known today as the Service Employees International Union (SEIU). In an effort to ensure reasonable labor contracts and negotiations with city unions, Chicago’s building owners came together to form BOMA/Chicago later that year. Today, BOMA/Chicago remains active in labor negotiations, collaborating with unions in three key service industries: engineering (IUOE Local 399), janitorial and security (SEIU Local 1). Labor agreements encompass all employee benefits, from health and wellness programs to pension funds and even professional training opportunities. These benefits are both generous and expertly-managed. For example, both pension funds negotiated by BOMA/Chicago for IUOE and SEIU have funding ratios of 90 percent. Negotiations can last as long as one month, but ultimately, the timeframe of each negotiation depends on the terms being discussed. The Labor Committee members thoroughly discuss each issue, evaluating the pros and cons and presenting alternative proposals that are in the best interest of member buildings and fair to the hardworking janitors, security officers and engineers on your property teams. BOMA/Chicago’s success in labor relations is a direct result of the commitment and expertise of each volunteer committee member. Labor Committee members are chosen based on their leadership skills, previous labor experience and willingness to dedicate the time necessary to fulfill such an important obligation. Although the exact number varies by year, there are usually about 15 members representing a diverse cross-section of BOMA/Chicago’s membership. And although the job is hard work, members tend to commit for the long haul, with many Labor Committee members having tenure of more than 20 years. My time on the Labor Committee has been a privilege and one of the most fulfilling parts of my BOMA/Chicago membership. BOMA/Chicago’s Labor Committee conducts negotiations for one of the three local labor unions each year and on a three-year rotation. Last year, the Labor Committee successfully negotiated a new three-year contract with the SEIU Local 1’s security professionals. And just this past April, we negotiated a new three-year contract with International IUOE Local 399 building engineers. Compared to collective bargaining agreements across the country, BOMA/Chicago members benefit from limited and straight-forward work rules and a reasonable cost structure. In addition to cost-effective labor contracts, BOMA/Chicago provides legal counsel to building members to aid in employee dispute resolution. If a building employee files a grievance against a member building, the Labor Committee will work directly with the employee’s union to resolve the issue internally, without formal litigation, if at all possible. Labor Committee members also offer educational programming on how to best resolve potential conflict situations between employees and management before they result in grievance filings. BOMA/Chicago’s collective labor support streamlines employee relations in buildings throughout the city and represents one of the organization’s most valuable member benefits. Do you have any questions about the Labor Committee or the work that we do? How has BOMA/Chicago’s collective bargaining efforts been helpful to your building? Leave us a comment below and let us know.